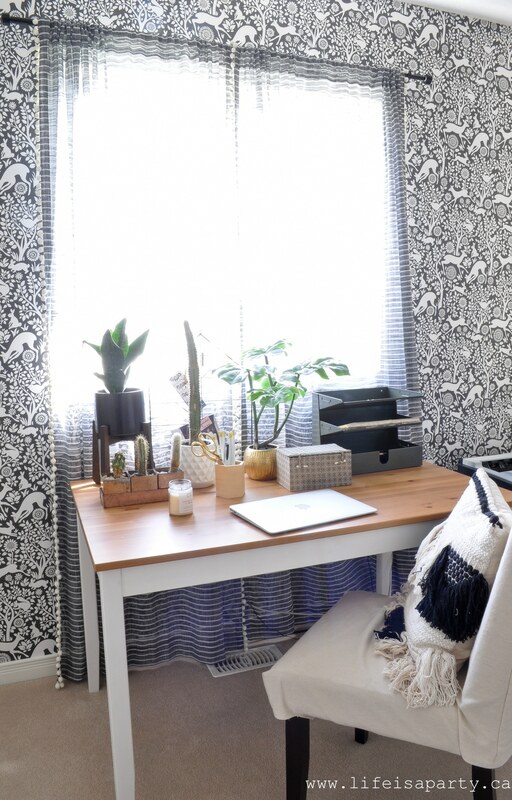 Black and White Boho Office Makeover: whimsical wallpaper, a wood bead chandelier, art, drapes, and lots of plants give this office the perfect boho vibe. I love my little office. 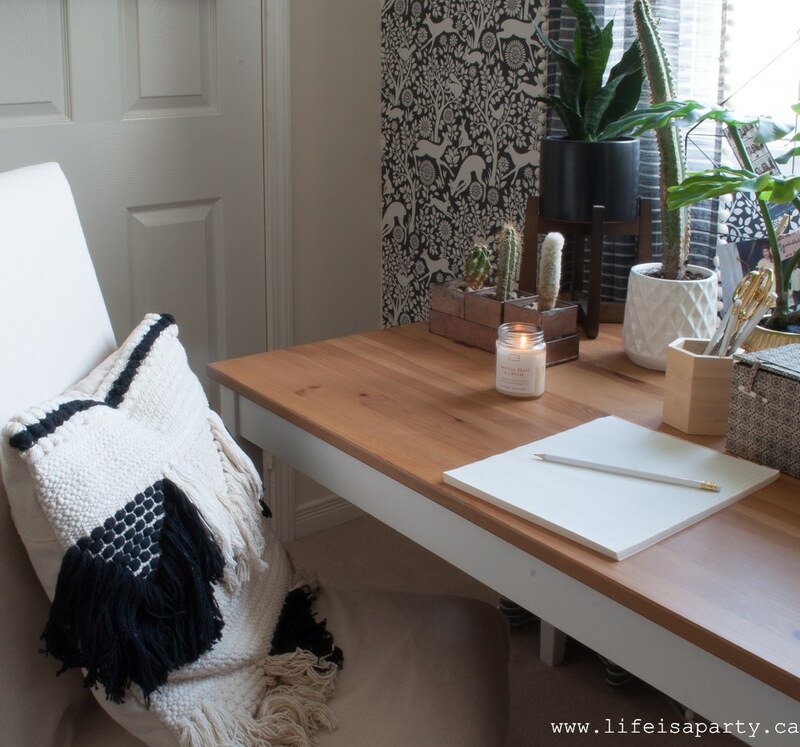 You might remember that for my 40th birthday my husband arranged for him and my sister and brother-in-law and my little girls to transform his study space into an office for me and move his stuff down into the basement, all as a surprise while I was away for the weekend. Read all about the surprise reveal here. It was the most thoughtful, generous, kind gift I’ve ever received. I absolutely loved it. A few years on though, it was time to give the space a little bit of an update. 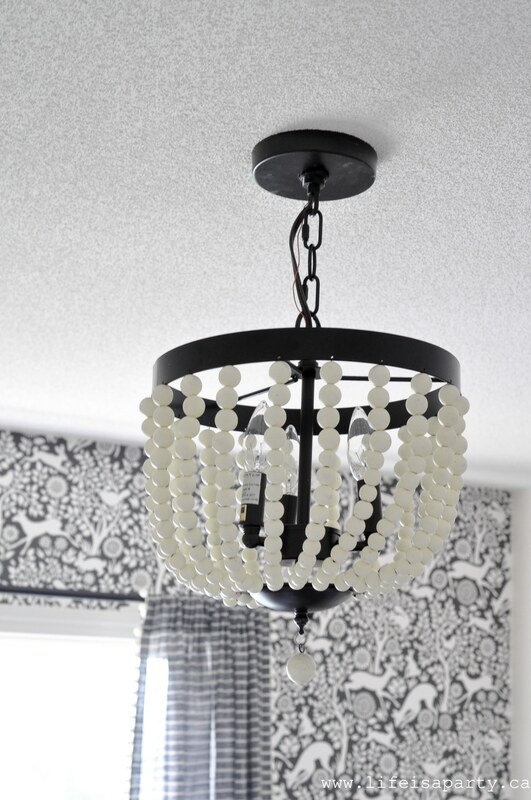 I decided I wanted to remove the pink accent colour and go with black and white for this space. I wanted to add a little bit of a boho vibe and refresh it a little. Here’s what it looked life way back in June when I started this project. 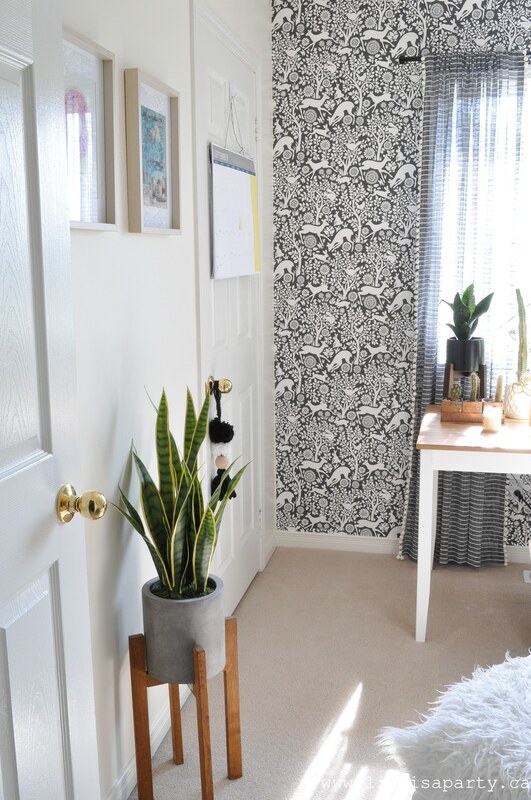 After finishing the six week One Room Challenge and completely making over my bedroom in that time, and the master bathroom as a quick refresh before that, I wanted to take on the office and my white garden in the spring. 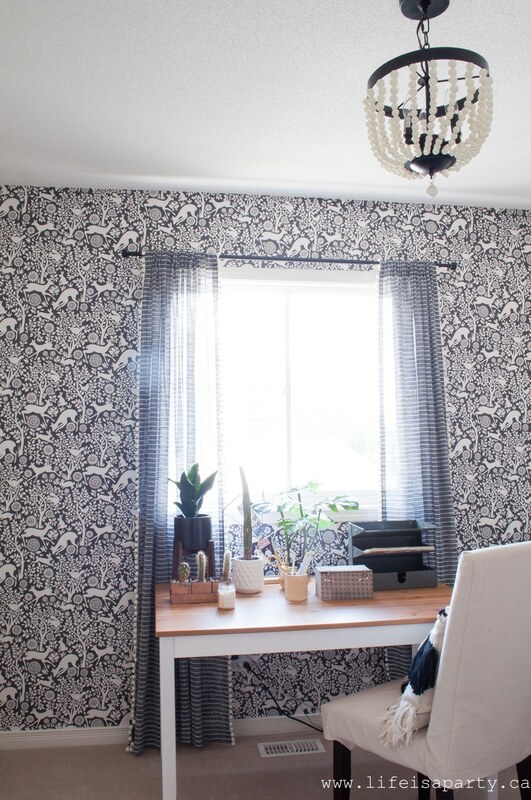 Well I finished the white garden makeover by the end of June, but this little office took its sweet time. And I kind of liked it that way. This might be the slowest makeover I’ve done, and you know what it had its advantages. 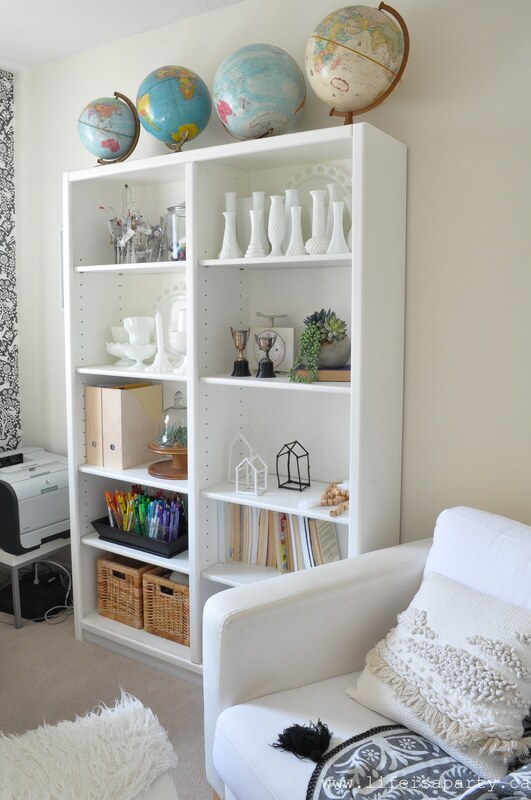 I was able to really think about each change I made, and take my time to find the perfect pieces for the room. And now I LOVE it! In these photos the office is really quite a mess, but it does show off the problems really well. The craft storage in the closet wasn’t really working for us. There was a ton of wasted space in there, since it was the builders basic closet set up for hanging clothes. 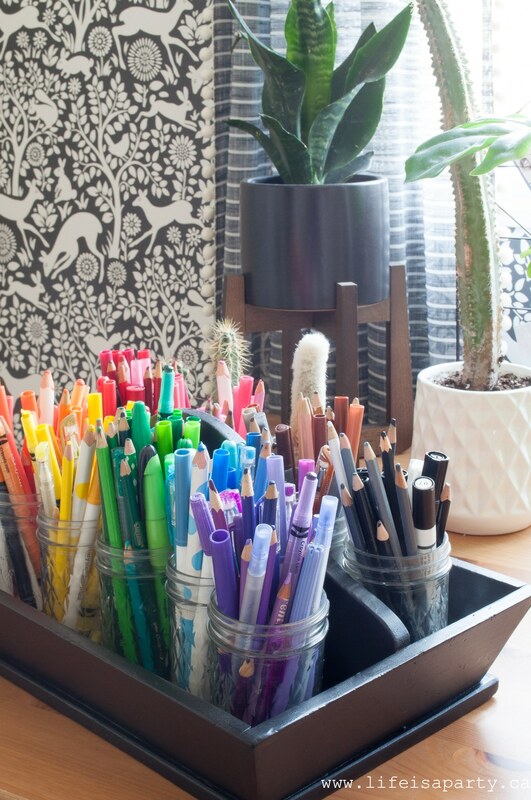 All those overflowing craft supplies were all over my desk. 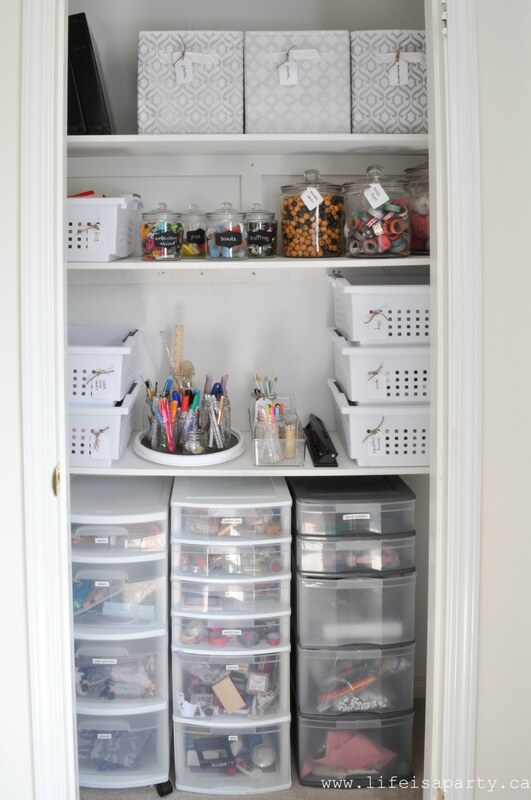 Since it was difficult to find anywhere to really put stuff away, the desk was regularly covered in craft supplies, and too full to actually use. The pink carpet had developed a wrinkle and no matter how many times I straightened it out it always seemed to end up wrinkled again. The pretty shelves were overflowing too, and definitely needed an edit. And the gallery wall felt like it needed a refresh too. 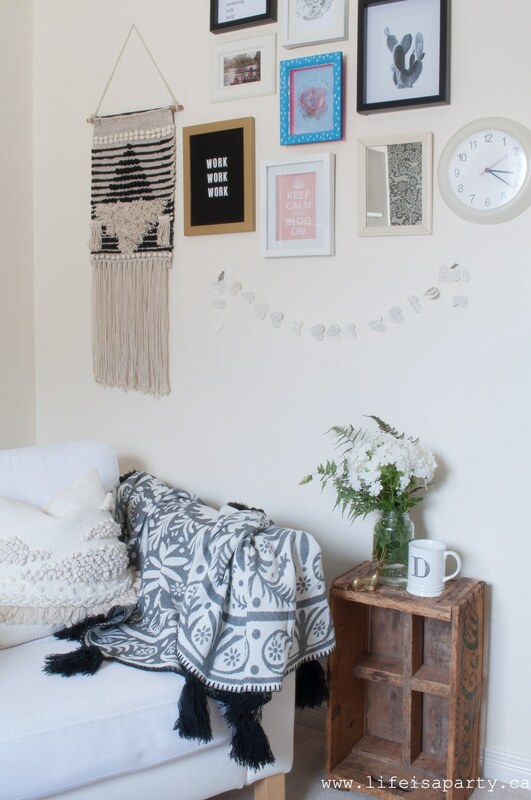 Most of all I just wanted to give the room a little special attention, add that boho vibe that I’ve been loving, and try out black and white in here since I’ve been loving it everywhere else in the house. I didn’t actually buy any new furniture for this room. The desk, shelves, and reading chair all stayed. All I did was change up the drapes, light, accessories, organization, art, and add one wall of wall paper. We didn’t even paint. Here’s how we still made it feel like a huge change. One of the biggest changes had to be getting the closet organized. I made some shelves for the closet and got everything organized and so much more functional. It has made a huge difference. 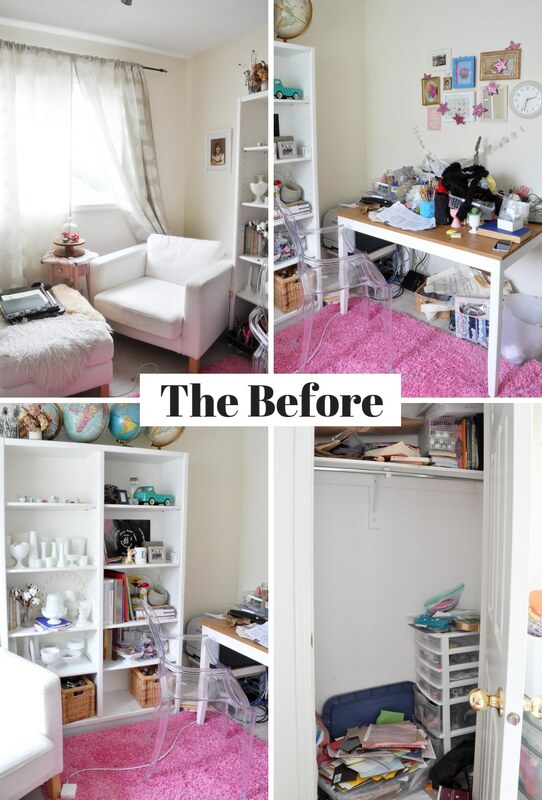 See the whole closet transformation here. Now my girls and I can actually find what we need, and know exactly where to put it away when we’re done. This meant the desk could finally function as a desk again too! I started out by flipping where the chair and desk were in the room. They were fine where they were, but I wanted a change. I also thought it would be nice to have the desk in the natural light of the window. I added in the new drapes, and loved them. I picked them because I wanted to add a little pattern to the room. The drapes didn’t quite feel like enough pattern, and the room still didn’t feel finished. Until, I added in the amazing wall paper. 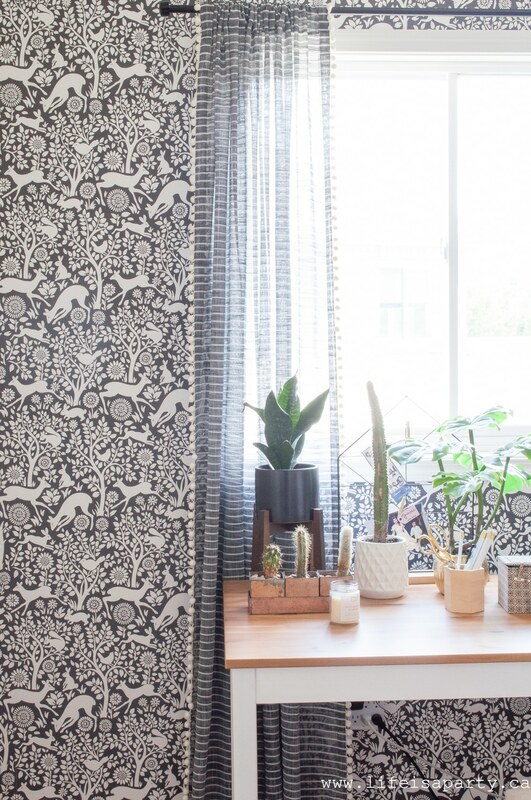 This Meadow Animal Wall Paper by Brewster Homes in Charcoal from Wayfair Canada has to be the most dramatic addition to the room. The wall paper adds a real sense of whimsy to the room. I had never hung wall paper before, and I was a little nervous. My ever patient best friend helped me hang it and it really wasn’t too bad at all. This wall paper hanging kit was really helpful, as was having two people. It turned out so well, and I’m so glad I added it to the room. 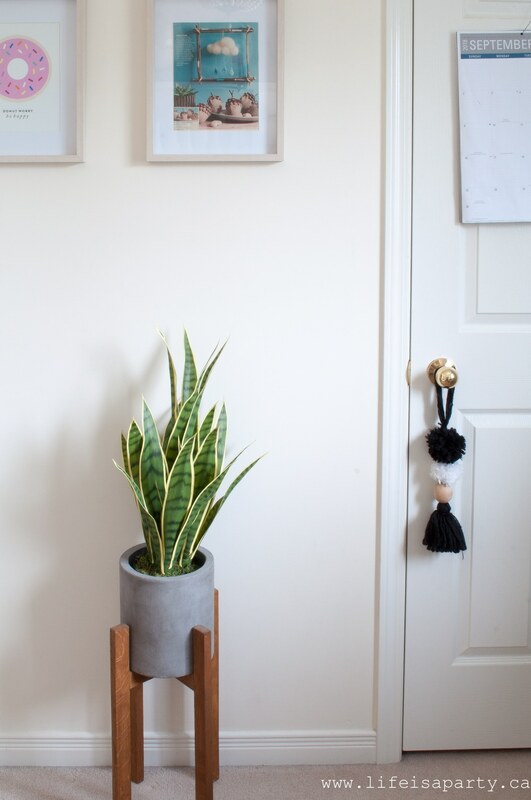 I knew I wanted to add some greenery to the room too, so I brought in a combination of faux and easy care plants. Can you believe I’ve had the large cactus since I was in University doing my undergrad -also evidence that cactus will survive just about anything, lol, including lots of neglect. Since, as I said, I took my time with this makeover, I had time to find some accessories at the thrift store. 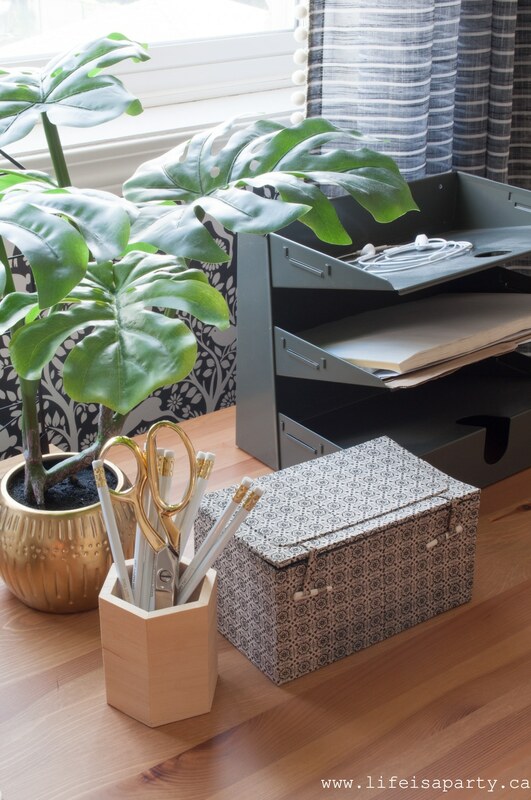 The paper organizer was found thrifting and the little batik box. It holds a few office supplies, and I love the pattern. Now that this room is done, it’s become a favourite homework and project spot. Over on this side of the small room we kept things simple. My sister framed this picture of my first magazine feature for me, so it has pride of place. I love the little boho touch with the doorknob tassel. You might have noticed one on the stairs in my Fall Home Tour last week too -so easy to make, I might need to stop myself from putting them everywhere. Over on the shelves, everything got a good edit. 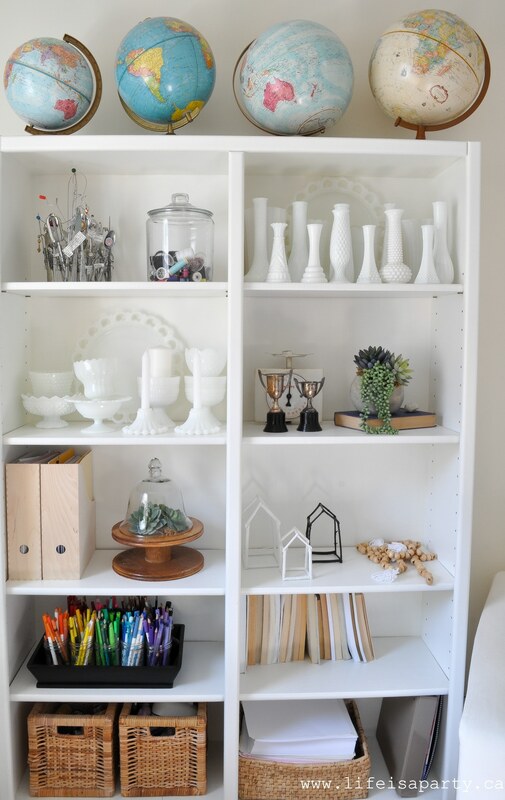 I kept my favourites -the globes, some art, the milk glass, and some office supplies. You can see my tutorial on how to make the twig houses here. 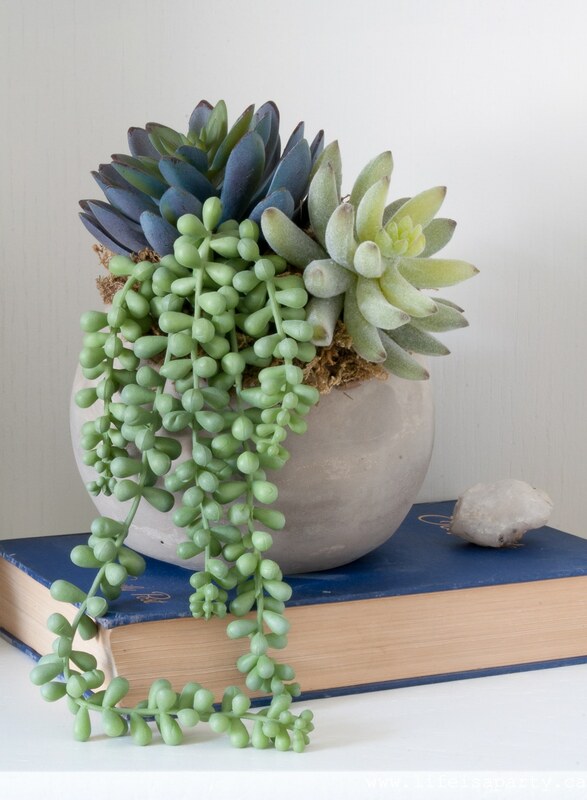 There were a few new additions, like these gorgeous succulents. The colouring caddy we’ve had for ages, but it used to be forest green and really rustic looking. I gave it a makeover with some black paint and now it fits this new scheme perfectly. It’s so handy for when my girls are doing homework and need to add some colour -organized and perfectly portable. Over in the other corner of the room the white chair and footstool are everyone’s favourite place to do homework, surf the internet, and read. 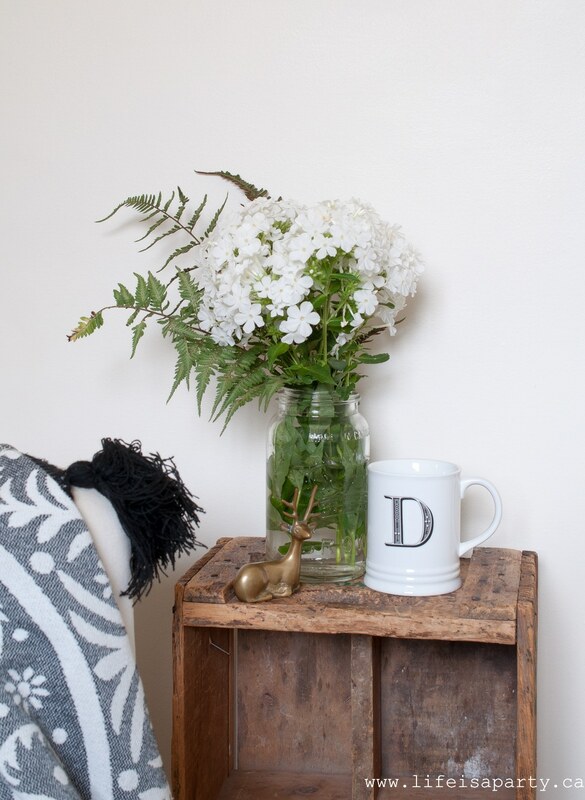 The little crate is the perfect spot to rest a cup of tea while you work. The gallery wall was a lot of fun to work on. 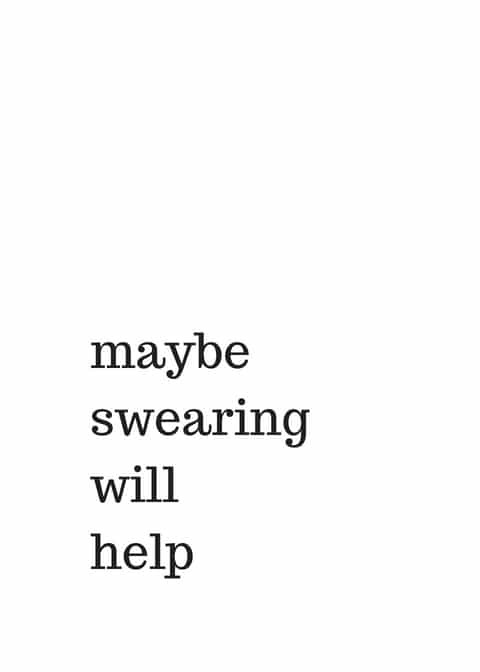 And one fun little addition with a printable I made -“maybe swearing will help”. My girls told me it was “inappropriate” so I knew it was perfect. 😉 You can download it as a free printable for yourself here. 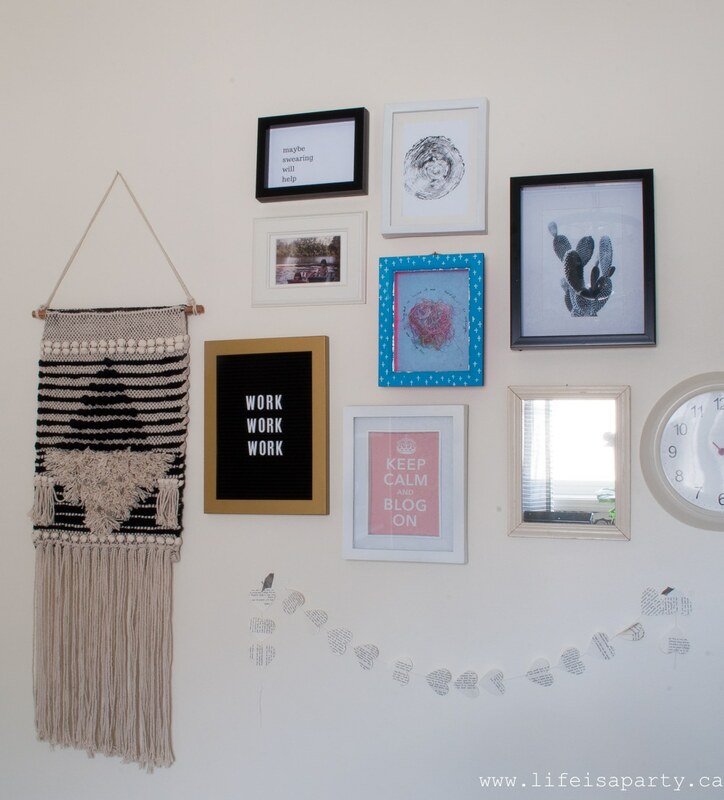 This gallery wall makes me smile, which is exactly what it’s there for. Once I finally got the room to this stage it was feeling pretty perfect, except for the light. There was nothing wrong with the track lighting that was there, but it didn’t exactly feel right. And then I found the perfect light, at the perfect price. I wasn’t too sure since I didn’t really need it, but it was too pretty to return. The makeover is finally finished, and I have to say that I love everything in the room. It feels so perfect. 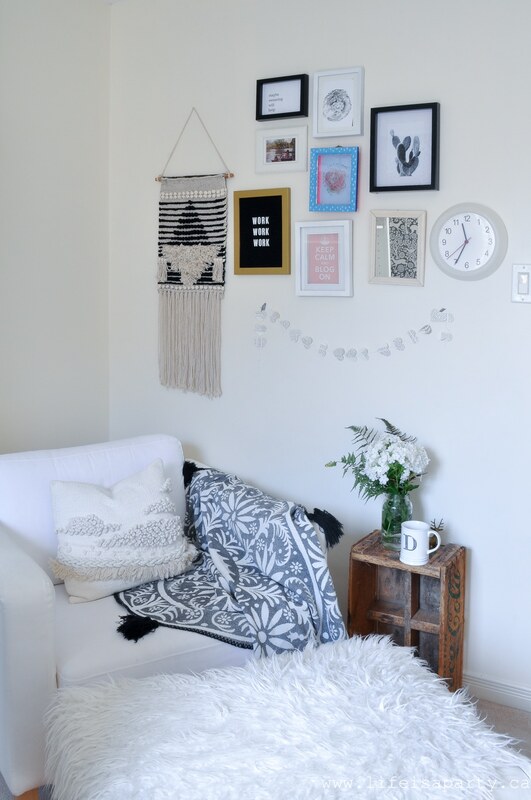 I love the black and white and I feel like it goes with the rest of the house now too. Now let’s see if having a beautiful and organized workspace helps me get some more work done. 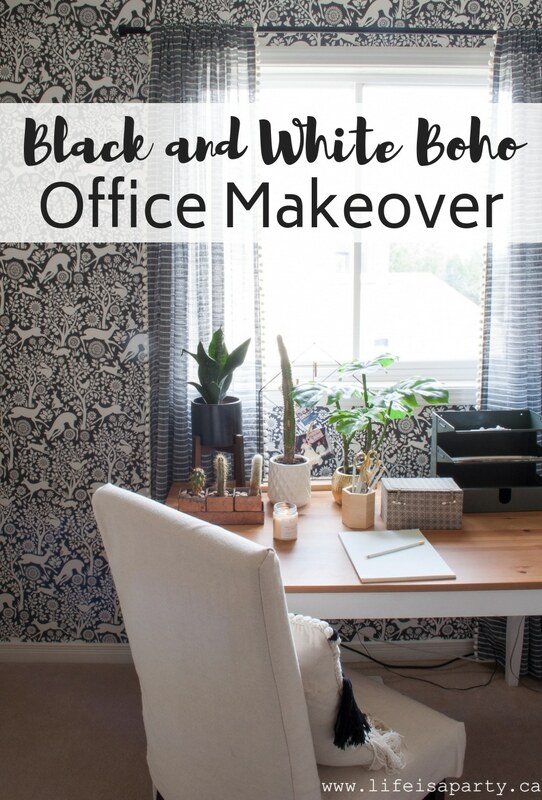 With a Black and White Boho Office Makeover, life really is a party! It looks amazing! Love that wallpaper in there, great choice! And your free printable is HI-larious, I need to put that in my office too! Love this room. 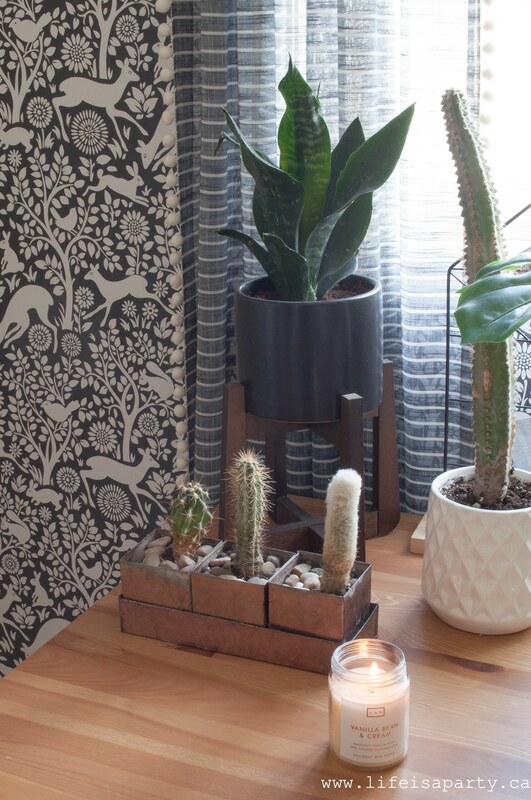 Please tell me where you picked up that tall thin cactus plant? I just watched the EMF health summit and one of the suggestions was to have one of those bad boys by your computer. I’ve checked a few places but have yet to find one…and voila! I see you have the perfect one for my desk! Please share! 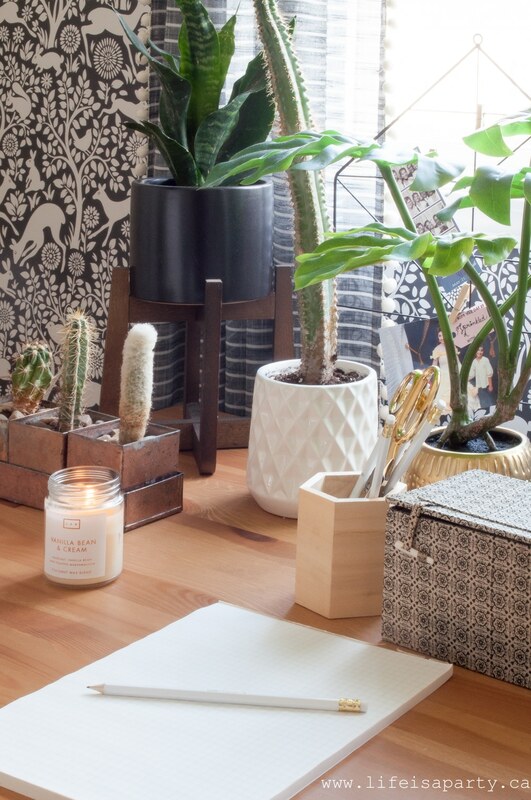 Aghh…just noticed you got that lovely cactus when in university (must have missed that the 1st read)…..do you recall where? Hi Sabrina, I don’t remember where it is from, but my local nursery -Vandermeer’s always has them.